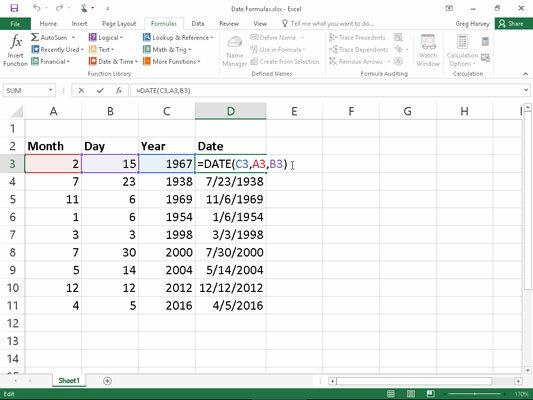 Excel 2016 contains a number of built-in Date functions that you can use in your spreadsheets. When you install and activate the Analysis ToolPak add-in, you have access to a number of additional Date functions — many of which are specially designed to deal with the normal Monday through Friday, five-day workweek (excluding, of course, your precious weekend days from the calculations). Keep in mind that the date inserted into a cell with the TODAY function is not static. Whenever you open a worksheet that contains this function, Excel recalculates the function and updates its contents to the current date. This means that you don’t usually use TODAY to input the current date when you’re doing it for historical purposes (an invoice, for example) and never want it to change. If you do use TODAY and then want to make the current date static in the spreadsheet, you need to convert the function into its serial number. You can do this for individual cells: First, select the cell, press F2 to activate Edit mode, press F9 to replace =TODAY() with today’s serial number on the Formula bar, and click the Enter button to insert this serial number into the cell. You can do this conversion on a range of cells by selecting the range, copying it to the Clipboard by clicking the Copy button on the Home tab of the Ribbon (or pressing Ctrl+C), and then immediately pasting the calculated values into the same range by choosing the Paste Values option from the Paste command button’s drop-down menu (or pressing Alt+HVV). This function comes in handy when you have a worksheet that contains the different parts of the date in separate columns, similar to the one shown here. You can use it to combine the three columns of date information into a single date cell that you can use in sorting and filtering. Using the DATE function to combine separate date information into a single entry. Excel then returns the date serial number, 42511, to cell C12, which you can convert into a more intelligible date by formatting it with one of Excel’s Date number formats (Ctrl+1). You must convert the DATE and DATEVALUE functions into their calculated date serial numbers in order to sort and filter them. To convert these functions individually, select a cell, press F2 to activate Edit mode, and then press F9 to replace the function with the calculated date serial number; finally, click the Enter button on the Formula bar to insert this serial number into the cell. To do this conversion on a range of cells, select the range, copy it to the Clipboard by pressing Ctrl+C, and then immediately paste the calculated serial numbers into the same range by choosing the Paste Values option from the Paste command button’s drop-down menu (or press Alt+HVV). DAY(serial_number) to return the day of the month in the date (as a number between 1 and 31). WEEKDAY(serial_number,[return_type]) to return the day of the week (as a number between 1 and 7 or 0 and 6). The optional return_type argument is a number between 1 and 3; 1 (or no return_type argument) specifies the first type where 1 equals Sunday and 7 equals Saturday; 2 specifies the second type where 1 equals Monday and 7 equals Sunday; and 3 specifies the third type where 0 equals Monday and 6 equals Sunday. MONTH(serial_number) to return the number of the month in the date serial number (from 1 to 12). YEAR(serial_number) to return the number of the year (as an integer between 1900 and 9999) in the date serial number. Excel returns 1916 to the cell (instead of 2016). Excel then returns 38 to the cell containing this formula. Don’t use these functions on dates entered as text entries. Always use the DATEVALUE function to convert these text dates and then use the DAY, WEEKDAY, MONTH, or YEAR functions on the serial numbers returned by the DATEVALUE function to ensure accurate results. U.S. (NASD) method (FALSE or method argument omitted): In this method, if the starting date is equal to the 31st of the month, it becomes equal to the 30th of the same month; if the ending date is the 31st of a month and the starting date is earlier than the 30th of the month, the ending date becomes the 1st of the next month; otherwise, the ending date becomes equal to the 30th of the same month. European method (TRUE): In this method, starting and ending dates that occur on the 31st of a month become equal to the 30th of the same month.